There is something very primal about slashing an ogam flesc onto a wand. Slash, slash, slash slash, 4 parallel strokes, is Saille. Saille in Gaelic is willow, very special to me. A notch, a second, a third… five notches makes Idad. I dont know what this word means. A mystery. Shift the knife, a long diagonal cut across the centre, is Muin. This word in Gaelic refers to the back of the neck, and I think of the heavy diagonal slash cutting across. No, perhaps it is the diagonal thrust of a strong neck bent forward under load? Anyway it feels exposed, vulnerable. Why do I think of striking? Two notches makes Onn, which is Gaelic for ash tree. A spear shaft, grey and strong. Finish with five straight cuts, Nin. This word can mean a fork, but it also means letters. Nin, the leters of the alphabet, the ogam characters. Learn the letters. Repeat the alphabet to yourself, Beith, Luis, Fern, Saille, Nin. hUath, Dair, Tinne, Coll, Cwert. Muin, Gort, nGetal, Straif, Ruis. Ailm, Onn, Ur, Edad, Idad. Learn it backwards. Help yourself memorise the order by counting on your fingers. Right hand , 1 finger, 2 fingers, 3 fingers, etc. When you get to 5, shift to the left hand. For 11 touch the fingertips together. For 16 touch knuckles. Now you’ll remember the letter shapes. Teach yourself the meaning of the Gaelic words. Beith is Birch; Luis is flame; Fern is Alder, Saille is Willow; Nin is Letters. hUath is terror; Dair is oak; Tinne is a rod of metal; Coll is hazel; Cert is a bush. Gort is a garden; Getal is the act of slaying; Straif is sulphur; Ruis is red. Ailm is pine; Onn is ash tree; Ur is earth; Edad and Idad are mysteries. You can practice by trying to read the ancient inscriptions (it helps if you can get a photo of a stone alongside a transcription to help you get going). The letter value of each character is just the initial of its Gaelic name, so Beith is B, Luis is L, Fern is F or V, Saille is S, etc. The stones were often erected in wild exposed locations. What more powerful name-magic than to read aloud the name of a forgotten ancestor in notches on a wild and remote standing stone. 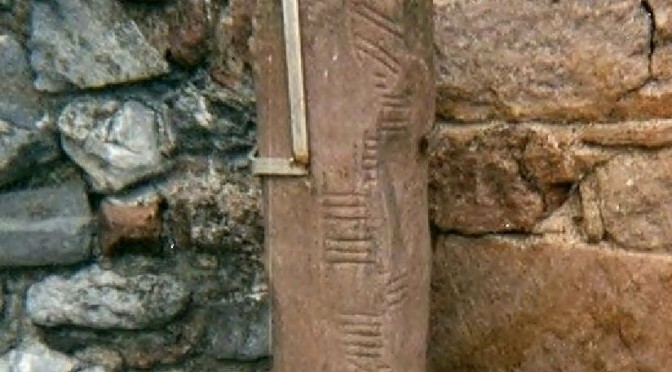 Photo:”Ogham Stone Rathass Church Tralee Kerry” by Jaqian 1997. Licensed under CC BY-SA 3.0 via Wikimedia Commons. Previous Previous post: Kelt and Keltic, or Selt and Seltic?